Both sides looked alike, this Saxon Housecarl would have had a circular shield. 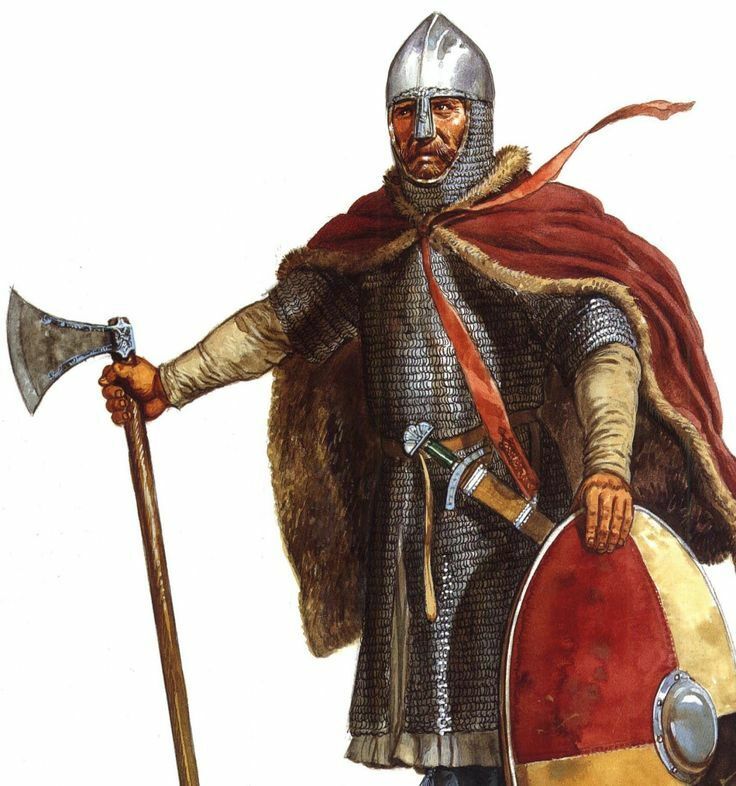 Norman poet Robert Wace described what the Norman infantry would have seen as they toiled up the slopes of Senlac Hill to attack the shield wall at its crest: `The English stood firm on foot in close ranks, and carried themselves right boldly. Each man had his hauberk on, with his sword girt, and his shield at his neck. Great hatchets were also slung at their necks, which they expected to strike heavy blows’. The English regarded the wary Norman approach with mixed feelings. Many were arrogantly confident. Barely three weeks before they had decimated the Viking ranks at Stamford Bridge. Some of the Housecarls were still showing flesh wounds, battered and bruised from the fight. They were weary. Harold’s core bodyguard had travelled 190 miles from London to York, fought a battle and rode 260 miles south again to Senlac Hill. Having fought one pitched battle and about to embark on another, they were physically and emotionally past their peak. Nevertheless, being at the top end of society, they had most to lose. The traditions espoused by the Anglo-Saxon vernacular poem The Battle of Maldon made much of the Housecarl’s duty not to leave the field, even if his lord had fallen. Like the Thegns and other freemen warriors fighting for the earls, they were a unique and close knit warrior society and would fight to the death to repel the invader. Standing behind them in the ranks, two to three men back, were three or four files of the Anglo-Saxon Fyrd. These were the men from the southern shires who had already been called out before in late June to oppose an invasion that never came. They were disbanded on the 8th September to gather a late harvest. By the end of the month they heard the king was battling the Vikings with the northern Fyrd, but there had been little time to reflect. Twenty days after they were stood down they were immersed in a rush of strange raiders whose hair was half cropped at the back and sides. Their women were raped, families butchered, houses set alight and their livestock killed. They were fearful yet burned with hatred, standing with their betters, pounding their swords rhythmically against their shields sustained by the bellowing chorus of Uit! Uit Out! Out! Robert Wace called them `a great assemblage of villainaille, of men in everyday clothes’. Many wore leather caps with a mix of old helmets, some with tough hide coats to offer some protection against sword cuts. This was an emergency, freemen had also been called up with the general Fyrd to protect their threatened shire. The smell of burned villages was in the air. It added to a sense of unease. During the preceding spring a fiery comet had been seen streaking across the sky, night after night. What did it mean? The harbinger of doom or momentous change? Death and destruction had already come in its wake. The Normans had also unfurled a Papal banner. Relics and the bones of the Saints meant a lot to these simple folk. Was God with the Normans? Maybe so, but many abbots and deacons were also fighting beneath Harold’s standard. `The English were to be seen stirring to and fro, were going and coming; troops ranging themselves in order; some with their colour rising, others turning pale; some making ready their arms, others raising their shields; the brave man rousing himself to fight, the coward trembling at the approach of danger’. Both sides did not run at each other. Despite the storm of missiles exchanged between the shield wall and approaching mass, the men on foot were wary and looking for a potential opening on the opposite side. As they locked weapons and grappled the Normans recoiled from the shield wall. The professional English warriors at the front looked for exposed peripheries, and lopped them off with axe or sword. Only elite Housecarls wielded the two-handed Danish battle-axe. At four to five feet long, the lengthy haft gave range and power to the swing. The Normans quickly appreciated that such a weapon differentiated the quality warrior. He could just as easily hook the unwary from their feet or entangle a shield and brain the man with the iron-capped spike at the end as swiftly dismember him on reversing the blade when he was down. Small throwing axes were accurately hurled, spinning end over end into the enemy line at 50 yards. Their swift approach was difficult to discern amid the melee and almost impossible to parry. The Saxon wall depended upon tight interlocking shields and emotional bonding for its integrity. Warriors had implicit trust that the man to his left would jab and thrust across his front to the right. Crashing up against it unbalanced Norman foot soldiers who became momentarily vulnerable to spear and sword jabs, coming over the top of the wall. Axe-men needed space, and would trade this in concert with an accompanying sword man. One step back created an enticing opening into which an unwary Norman might plunge only to be despatched by the backward swing of an axe or a vicious accompanying sword thrust. An accomplished axe-man could wield his finely balanced blade and haft in a two-handed figure of eight sequence for some time. Skilled warriors did not expend energy hacking and slashing, they employed economical pre-practiced fighting sequences, cannily deducing any weakness on the opposing side. Spearmen jabbed at face level, forcing their opponents to raise their shield which temporarily blind them to attack from another companion. Spear points jabbing in unison outside the shield wall were difficult to penetrate. The integrity of the shield wall was all-important. `They were so densely massed’ described Norman Chronicler William of Poitiers `that the men who were killed could hardly fall to the ground’. The shield wall had never faced armoured horsemen before. Harold’s astute hill crest siting did much to compensate for their weight and height advantage. Even so, the ground trembled as the great Norman Destriers rode up. To their surprise and consternation the Norman knights ricocheted off the pliable barrier. All they could do was ride alongside and try to barge an opening while defending and jabbing lances and swords across the top of the shield wall. Horses might be felled by an axe or tripped by spear jabs, riders dragged off their horses and despatched by axe and sword or dragged inside to be dealt with by the Fyrd. Breaking ranks was fatal to the Saxon defender. When the Bretons broke on the Saxon right the Fyrd rushed after them and were cut down to a man by the Norman horse. Conroy raiding sweeps of groups of ten to twenty knights were irresistible in the open. Medieval battles rarely lasted more than an hour or so. Too much was at risk in an era more used to the skirmish or quick raid to gamble all on a deliberate battle. Exhaustion and the deaths of key Saxon leaders took their toll. Harold had already lost two brothers, an irredeemable political and socio-economic loss, when he was allegedly hit in the eye by an arrow. Wace describes how `in his agony he drew the arrow and threw it away, breaking it in his hands; and the pain to his head was so great that he leaned upon his shield’. True or not, Harold was cut down and dismembered in a frenzied attack by a group of Northern knights. Whether William had received a resupply of arrows is not known. The English had left their archers in the north. Tired and totally immersed in the melee of close combat it was difficult to hold a crumbling shield wall with missiles raining down in depth. Even as the defeated English army was cut down straggling away from the field, chased by the merciless Norman horse, they retained their innate aggression. Housecarls fought on despite having lost their lords. As dusk fell pursuing Norman knights tumbled into an unseen ravine, the Malfosse or `evil ditch’. Immediately the retreating Saxons rounded on them, slaughtering them in large numbers. The hard fought battle had been close-run. Defeat was, however, total. Saxon survivors would never again enjoy society as they knew it before 14th October 1066. This entry was posted in British, Medieval, Warriors by MSW. Bookmark the permalink. I have personally walked Senlac Hill. The Saxon battle position was well thought. Only a combination of archers, knights and foot soldiers could have defeated Harold’s force. Leaving his archers back was obviously a mistake in retrospect. Harold had spent some time with the Normans as they fought in Brittainy. Hard to believe that he had not learned the basics of Norman combat tactics. Coming off a victory against Harald Hardrada’s army a few weeks prior could have given them a false sense of invincibility. It is difficult to win a battle from a defensive position. The Saxons possessed no cavalry and therefore lacked the ability to maneuver against the Normans. Their fighting style was restricted to simply standing in the way and trying not to get killed. The best of the Housecarls fought bravely and deadly. Losing your leaders in the course of the fight did not help the Saxon defensive plan at all. Hastings was a good old fashioned death match with kingship as the prize. Hard not to see the outcome as Divine Intervention on the side of the Warriors with the Papal Banner.